preHIRED offers an online part-time course with guaranteed job placement in tech software sales. Students will learn sales-related software in various categories like CRM, lead generation, lead enrichment, sales automation, productivity, and artificial intelligence. Through preHIRED’s sales training and job placement program, students are equipped with the skills to help them land their dream job and potentially reach a six-figure salary. This online course is for anyone looking to make a career in software sales, whether you have no experience or 15 years experience in the field. Students learn methods from the Science-Based Sales® system that will enable them to become sales development representatives. Students will learn interactively with live chat, templates, modules, and videos. preHIRED helps students land technology sales jobs by providing personal coaching sessions from pH trainers and helping students with job research, job applications, and offer negotiations. If a student does not receive a job offer within 90 days, their tuition is refunded. We help regular folks get $100,000+ sales career at tech companies in 6 weeks. Students will learn three key pillars for sales success at tech companies: Tools, Skills, and Workflows. Tools: Sales-related software in various categories like CRM, lead generation, lead enrichment, sales automation, productivity, and artificial intelligence. Skills: This area of training focuses on sales calls (not COLD CALLS which don’t work), writing compelling emails, running sales meetings, qualification calls, discovery calls, demo calls, follow ups, negotiation, closing, and overcoming objections. Workflows: Most salespeople who are struggling to make more than $100,000 annually are NOT managing their time effectively. They don't have a framework for how to do every activity broken up into each hour, day, and week. We show you how and when to specifically use everything you've learned in the day-to-day selling activities you'll be doing for a tech company. Before I started with PreHIRED I only have about a year of sales experience, my main career focus has actually been dental hygiene for the past 3 years. But, I knew I wasn’t going to be retiring as a hygienist, so after researching into software sales, I soon discovered PreHIRED. At first I thought it was definitely too good to be true (Scam lol), but the more I talked to the advisors I realized it was legit. The next issue I had was just the lack of core fundamentals to succeed. But they reassured me that’s one of the main focuses of the program. Once I was enrolled it was amazing. Josh does a fantastic job of laying out the program, I really didn’t have any questions as I went through it all. I learned all the things I was worried that I didn’t have, and their process was set up so well I was already getting interview offers before I was even done with the program (that I had to regrettably tell to wait until I was done!) PreHIRED is definitely worth it, you always have someone you can reach out to. It gives you a great network of people, and it’s easily able to be done even with a full time job. Thanks Josh! This is an in-depth mentoring course on Science Based Sales for the Software Industry. You get all the tools to learn the industry, the softwares, and be much more ahead of the game than any SDR or BDR who is currently in the Industry. You learn from Joshua Jordan, who is a seasoned and successful Salesperson in the Industry and has worked with many influential people. I highly recommend this, as they will help you get a job as and SDR or BDR and get you the salary you deserve. When I signed up to PreHired I had zero sales experience, but I have always been inspired to try myself in sales. Having spent the last few years of my career in IT I knew that I wanted to stay in the software industry and sell digital products. So the decision was made and at that point, I just needed direction and guidance that would lead me towards my career goal. This is when I came across PreHired program. I didn’t sign up right away. I did some research, checked the reviews, weighted pros and cons and finally signed up because I didn’t find another program that would offer similar kind of training and assistance in job search. Besides of sales psychology aspects and sales developments process techniques, at PreHired they teach you how to use a variety of automation tools and streamline your sales process. This particularly helped me in my job hunting. Now I am actively interviewing for SDR roles in my city, including remote positions. Joshua is a great presenter and each training session was filled with useful information, tips, and examples. I would totally recommend this program for people who want to grow professionally, but be ready to put some real work into it. This course is most suitable for those who already have some sales related experience since most companies will be choosing more experienced candidates over you. This is the obstacle I have encountered in my job search. But I am staying optimistic since I feel that knowledge that I received from this training is not going to waste and I'll land a job eventually. All in all, I do consider the money I spent on this course an investment in my professional development. Prior to meeting Josh, I was a construction worker. Even though I had some sales experience, my knowledge of the sales development process was lacking. Josh and the preHIRED team really turned my basic knowledge of sales into an arsenal of skills. The preHIRED program broke down how to target ideal clients, reach out to prospects and build relationships, pinpoint a client's needs, organize an effective and efficient workflow, and stand apart from the competition...that is just scratching the surface of the indispensable knowledge gained. Many of the things I struggled with prior to preHIRED were covered in the program, which finally gave me a true understanding of that concept, and so many new concepts were learned. Josh and the preHIRED team have equipped me with the tools I need to succeed on this new path I am traveling, helping me change my life in a way I didn’t think was possible…and in a very short time as well!! I now know not only what I need to do, but how I need to do it and why...that is powerful. Josh, thank you and your awesome team for such a phenomenal program!! I can't wait to learn more from you in the future. The course gave me the knowledge and skills to get a 70k a year job. Plus it comes with a 100% money back gurentee if you dont get a job so you cant lose. I come from a very traditional phone sales background. If you can imagine all the movies from the 90's and early 2000's about sales, that's where I come from. I always knew there was a better way to sell, but I couldn't figure it out on my own, because honestly there is too much information out there on the internet. Prehired seemed to offer a solution to training you in necessary tools and workflows and enabling you to get the job you want! As a salesperson I was skeptical that they were overselling and wouldn't deliver. I can tell you now they did deliver just like Josh said they would. Personally I love doing research and finding out new information, because then I can help others solve problems with the solution I can offer. Learning how to use the lead generation tools blew my mind....literally. Well maybe figuratively ha. I couldn't believe I have been making things so hard on myself in the past. If you are considering this program and reading this recommendation, as Nike says...just do it. If you know that you have the ability to learn and want a high paying software sales career (key work is "want") -- then just check out their website. If you are feeling hesitant like I did at first, maybe schedule a call with their admissions team. It helped me so much because they asked me questions I never had thought of before, and it helped clarify everything so much. Now go sign up! Before I joined preHIRED, I worked for Continental Tire as a Field Sales Representative. I learned a lot about sales, but then I decided to open my own small business. I ran it for a year and a half. Although I enjoy being an entrepreneur, I wanted to add an additional stream of income. Software sales is the most lucrative industry to be in so it was where I needed to be. I knew that preHIRED would give me the skills that I need to get my foot in the door. preHIRED isn’t cheap. I was hesitant to spend that much money on a course instead of investing it in my business. But after soaking in their money-back guarantee, I felt that it was the best way to turn the cost into a six-figure stream of income. 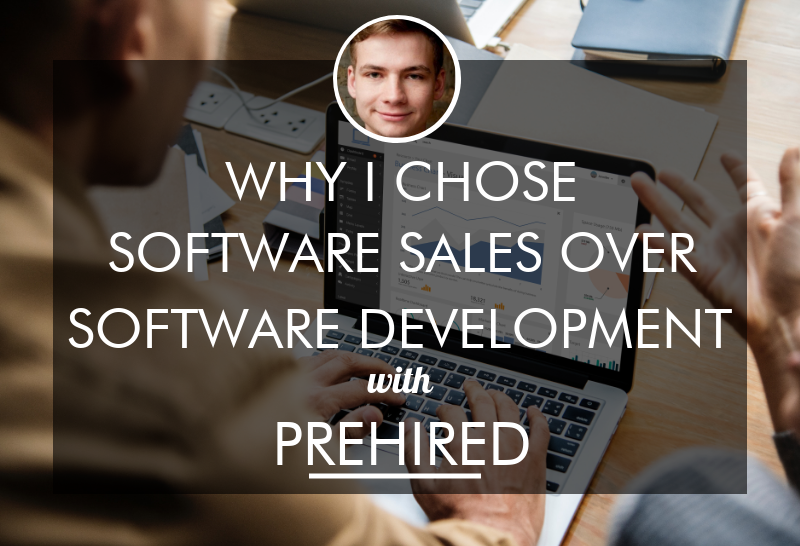 My favorite part of preHIRED is learning all the tips and tricks that go into the sales development process. I’m now able to connect with hiring managers directly using the software that his program taught me. I’m excited to start my new career! If you’re on the fence of joining preHIRED, I’d recommend to put some Nikes on and just do it. It’s well worth the money if you’re able to turn the cost of “tuition” into a six-figure stream of income. Plus, you’ll save a lot of time getting hired. I was certified just 2-3 weeks ago and have already had interviews at over 17 different software companies -- all for remote positions. After teaching math for 10 years I’m transitioning into sales. I wanted to be able to go into a career where I could continue to serve people, but also to be rewarded for my hard work and skills so I could provide for and serve my family better. Not having any sales experience or training I wanted to find someone who has been very successful at sales who could teach me how to be very successful too. I stumbled across preHIRED on a craigslist post that promised you could get a six-figure sales job if you complete their training course. That obviously caught my eye but also raised my suspicions as it sounded too good to be true. The more I looked at their website the more convinced I became it was a scam. They even guaranteed if you didn’t get a job in 90 days you’d get your money back. I then watched a lot of the testimonial videos and concluded there is no way there are dozens of people in on a scam and all are willing to put their faces on video that could be used as evidence against them. Then I spoke with Lael Cook, one of preHIRED’s excellent Software Career Consultants, and he answered some of my questions and gave me a free 4-hour intro course for preHIRED. After working through the intro course I was convinced that Josh not only knew what he was talking about and could deliver the results promised, he had previously been very successful in software sales. My favorite parts about the full preHIRED course were the tools and the techniques that are going to make me a very successful software salesman. I’m very glad I researched the program further and enrolled! I’ve been propelled onto a path which will enable me to serve through software sales and making six-figures while doing it. Thanks to Josh for putting this program together and to Lael for overcoming my objection and getting me to sign up! Prehired made sales incredibly fun! Before preHIRED, I was a regular guy working at a golf retail store and a golf manufacturer for about 5 years. At that time, I was tired of scraping by with an low hourly wage and was looking for real financial freedom. When I first found preHIRED, I was excited but super skeptical. I remember thinking, there's no way this can be that simple... it has to be a scam right? I am now a Science-Based Sales® Expert in lead generation and the sales development process. I know exactly how to prospect, qualify, and close deals at a high level. Knowing I can land almost any junior level software sales job and confidence in my workflows -- sales is now incredibly fun! As I am running my sales funnel, I know I'll have my top choice in no time at all. Thanks Josh and preHIRED! I learned a lot from the preHIRED program. The Angel.co section helped me to understand how to connect more precisely with founders of firms. The CrunchBase section was also amazing. The information that can be learned from Crunchbase will come in very handy. Prehired was life changing, I went from hating my job to getting a new SDR position 3 weeks after completing the course. What I learned really set me apart from the other SDRs that got hired and in 3 months I was promoted to an AE! I stumbled upon Josh's course during a point in my life I had no idea what I wanted to do. I had thought about sales for some time and especially loved technology. After taking the course I was extremely prepared for a job as an SDR for a SaaS company. I blew the doors off of my first interview portraying my konwledge from the course and landed a job at TriNet. I am in my third month and loving life. A complete 180 from where I was 6 months from now. Thanks Josh! Joshua has put together a phenomenal training for future SDRs with PreHired. From developing accurate buyer personas to managing closed deals, PreHired covers all aspects of the sales development process. The integration of software and automation was my favorite section - the concepts and recommendations have made my workflow more efficient. Although I'm not new to sales, Josh's streamlined process has helped me raise the bar and challenge myself to be better in sales conversations. The best part? This is just the beginning. I know from several conversations with Josh that he has a genuine heart to see future SDRs succeed and he's working 'round the clock to make the program even better. His open mind to member feedback and relentless ambition to make the best software training on the planet will keep PreHired around for years to come. Anyone looking for a long-lasting career in software sales needs to join PreHired asap! Going into my senior year of college I knew I wanted to enter the world of startups and entrepreneurship. With no real business or tech skills, Josh gave me my first real opportunity. Never having been in sales, I knew basically nothing. But through Josh's mentorship and coaching, I've learned the in's and out's of the entire sales process. His attention to detail and training style make it very easy to grasp different concepts from sales tools to email copy to running meetings. Although I've only been in the software sales space for a little over a year, I feel I am years beyond my experience and I truly owe it all to Josh. Many people are surprised that I've only been in sales for a year, but again, that is all thanks to Josh. If you ever get to work with Josh, or at least be trained by him, your career will thank him later. My sales experience has all been in the field of real estate. While I enjoy real estate, I have a growing suspicion that the role of real estate agents in the future will be greatly diminished, if not completely erased by technology and automation. That is why I decided to enroll in preHIRED. The idea that I could be trained on all of the latest sales tools and processes was intriguing. Their extremely high success rate with helping students find a job after completion of the course was the thing that sealed the deal. I tend to be pretty confident in my abilities so I didn't have too many doubts upon enrolling, but once I got into the material I was shocked to find out how much I didn't know. The amount of productivity and automation tools available to sales people is astounding, and it was hard for me to wrap my head around it all at first. However, my favorite thing about the course is the way Josh lays out the information in short, concise videos with supporting documentation that is easy to download and review. After completing all the modules and demoing many of the best tools of the trade, I am confident I will be an asset to any SaaS sales team. If you are feeling stuck in your career, or maybe you just need to sharpen your sales skills I would definitely recommend preHIRED. If you put in the work, you too can be successful with this program. My name is David Andres Torres. I professionally began my “sales career” selling life insurance, been doing that for about 3 years. I had doubts about myself, could I really do this? Could I really pull this off, learn the complicated things and technical things in the program, raise the money quickly to purchase the program and complete it quickly. I took time but I don’t regret it and I am so excited about it. It has helped me see that business and sales, especially in the software industry, is modern and new. Everything else and how things are done in the past will become obsolete and ineffective. This process will continue to evolve and I want to evolve with it. I have talked to others about doing it who sought me out on Facebook or LinkedIn. I said to them and I say to you, do it, take your time with it, ask questions, seek help, work hard and you will be great at it. It will be worth it. Josh and PreHired was totally worth the investment. I couldn't of landed my BDR role without the PreHired training. I was confident in the interview and going into my new position. The program isn't for everyone, it requires dedication and actual work but, if you follow the steps and maintain the right attitude, PreHired can definitely get your foot in the door! preHIRED is the best sales training bootcamp I have completed! My previous sales experience consists of demoing and selling essential oils in retail stores and events as well as selling life insurance for a couple months. The jobs were ok, but were not helping me make the kind of money that I wanted to make doing sales. Than I came across an ad on Facebook for PreHIRED. I really love sales and realize that this is something I want to have a career in. I was not able to find the right sales job and education that would fit my wants and goals. Seeing this program really got me excited for learning new systems and methods and increasing my knowledge in sales, specifically software sales. They also help you find a job which is a huge plus! Initially I thought that this program was a scam and that it was some kind of "get rich quick scheme" that seem to be all over the internet. However after researching the company, its employees, watching/listening to testimonials and than research the people in those testimonials, I realized that this was not a scam and that it was actually a very worthwhile opportunity. This program helped me learn the sales process and the different science based methodologies that will really help me communicate with customers better. My favorite part was going in depth with software and tools that I will be utilizing every day in my role. If your thinking of doing this program just know, it takes some work, but it is totally worth it. If you want a career in software sales and learn the best techniques in the industry this course is for you. Before learning about preHired, I had been in account management at a few recognized ad agencies, and most recently spent 10 years in B2B advertising sales. Though sometimes #1 nationwide and a million dollar annual producer in advertising sales, the sales had become more difficult to generate over the past three years. It was apparent that my systems were lagging relative to the digital transformation of sales and marketing. Having never engaged an online educational site/product, I figured preHired would probably be something close to that of a network marketing or MLM venture. I was truly skeptical as to what new learning I could gain relative to selling…but was open-minded given the speed with which technology has evolved in the last 10 years. My eyes were opened to the need for personalization at scale! Learning how to create and automate more personalized communications excited me the most. I look forward to enhancing the quality and quantity of my messaging in such a way that both outbound and inbound conversions reach new highs. For anyone (and everyone) in B2B sales – not just software sales - the insight and guidance provided by Joshua and the preHired team are easily worth the investment. That’s before getting your career started in software sales. By year two or three, if you apply the principles and tools, the ROI could be 100x! I had a lot of traditional sales experience, meaning it had all been face-to-face, over the phone, offline selling - mostly in the financial services industry. I wanted to transition into the world of software sales for the obvious benefits - good salaries, the opportunity to work for an exciting and growing company, great commission structures, possible equity in the company, and remote work if possible. In part because of the training I received from PreHired, I am now working in software sales, landing an 80k starting salary, equity in the company, a fabulous commission and bonus program, and I work from home - and I didn't even finish the certification yet. Couldn't ask for a better gig and I am confident the training I've received will also lead me to much success in the new job! #1 Tech Bootcamp - Hands (and Feet) Down! Want to get into Tech? Let me save you time and money deciding on which tech bootcamps to take part in (I have taken many - just to see where they differ, and because I'm a little bit of a knowledge junkie...) - and I am here to save you time by telling you to just take part in the preHIRED program! I was offered a tech position with a TOP 500 tech company the very first go around after completing the bootcamp. The program WORKS, and you will only wish you had went through this program FIRST if you try others instead of this one (I know. Been there, done that). 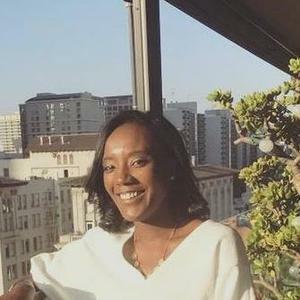 As an experienced sales and marketing/business development professional with some tech experience, I was eager to learn all of the top, current methodologies and practices to stay "on the ball" so I could seek out my next best tech career. This program was thorough, logical, and extremely detailed - even showcasing unique, creative elements that often are left out or forgotten by applicants during their tech employment search. The CEO of preHired is open, accessible, and willing to help in ways that many companies miss the mark on, and can serve an example to others on how "good" companies can be "great" companies just by how they handle those they interact with at all levels of the corporate spectrum with whatever programs they are offering. I speak from experience and was offered a position the very first time I applied after going through this program! (Yes, I am repeating myself, because this will be YOU saying it the next time - if you just sign up and take your life to the next level...you know you want too...). Make no mistake, preHIRED is the Real Deal - so sign up already! This course hits on literally every stage of the SaaS sales process - and everything is actionable. Most courses that I've taken give you a high-level overview of sales, but this gives you a clear path to getting a job in software sales, the skills you learn are completely applicable. SaaS sales positions are incredibly competitive and for the most part, your application is going to get ignored. This course teaches you how to get around all of that and get straight to the decision maker (the hiring manager). Once you're in the interview seat, this course prepares you to get the job. It's an all in one class, that in my opinion, is way worth the money. The staff is incredible and extremely knowledgeable - if you're looking for a foot in the door in the tech industry, this is it. I came across Josh's PreHIRED course during a time in my life when I had no idea what I wanted to do after my military career. I was actually deployed in another country when I was searching and found his course and was very interested in it. I had always had an interest in sales and software companies as well so this seemed like a great fit for me. After taking the course I feel very prepared to start working in SaaS sales in an SDR role. I am both excited and eager to move forward in the job search process moving forward because of what I have learned in this program. Thanks so much Josh! I have been in sales for close to 3 years now. I love being in sales, but the companies I have been invovled with had little to no room for opportunity for growth. I wanted to become a part of a company where being a top performer was rewarded with growth. I found Josh and PreHIRED through some research and immediately peaked my interest. I watched all the testimonials and had seen real people were having there lives changed from this program and I was inspired. I wasn't the most tech savy person in the world before joining this program, but josh breaks down every step and action to make it easy to understand. My favorite part about going through the preHIRED program was learning lead generation and sales automation. Now I have learned the tools necessary to succeed in software sales! Thank you to Josh, Andrew and all at preHIRED for all of the help and guidance! After working for a religious nonprofit after college, Isaiah Ascher wanted to get into tech. He started learning to code, then a friend helped him get a customer services and sales job at an insurance company, where he thrived. But Isaiah wanted to go a step further and get into software sales, so he enrolled in preHIRED’s SaaS sales training program. Isaiah tells us about why he enjoyed the preHIRED curriculum, and how a previous preHIRED grad helped him land his job as a Sales Development Representative at Outreach.io! Tell me about your background before you completed preHIRED’s SaaS sales program. 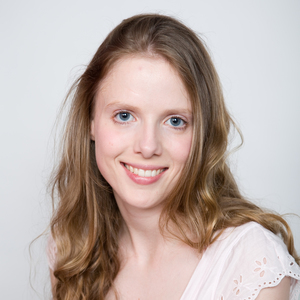 I had a rough childhood – I bounced between foster homes until I was adopted. I was forced to do things for myself, take care of my siblings, and make sure there was food in the fridge. It was difficult, but it’s made me incredibly driven to succeed. I was never really looking to get into sales, I just sort of stumbled into it. After high school, I attended Bible college and then worked in digital media for a religious non-profit in San Francisco. I worked on their website, social media strategies, and helped implement new technologies so they could receive donations via credit card. When I moved home to St. Louis, I used Codecademy and Code School to learn to code and try to get into software development, but it was limiting. There was no way to scale my income if I worked harder or smarter. Then a friend helped me get a customer services job at a call center for insurance company Carshield. Within the first month, I received a raise! After six months, I transferred to a sales role with a base salary plus commission. In my first week in the sales department, I surpassed their deal goal and I felt like it was something I could really do with my life. Eventually, I was looking for more than consumer sales, so I decided to apply for a job at Square. At this point, an ad for preHIRED came up on my Facebook feed, so I did some research about their SaaS sales training program, and used their free tips to actively sell myself to Square as a salesperson. But I was second for the role, so I went back to preHIRED to learn more about software sales process. Looking back, how have the skills you learned at Bible college and in web development helped you become a successful software salesperson? Studying hermeneutics – trying to understand the original intention of a text through a language like Greek or Hebrew – in Bible college was helpful. In software sales, you’re really trying to find and understand the need at the prospect company. I never really correlated it until a couple of months ago. I also passed out tracts on the street which I never thought of as prospecting but it actually was! I would talk with people and collect contact information to follow up with them later – it was an entire sales sequence right there. I didn’t expect to see such a correlation between those life skills and my new career, but it’s exciting to find them. Regarding web development, someone who is coding is someone who wants to understand how things work. I wanted to understand how a website is built. My adoptive dad is a software engineer, so while he worked on the backend, I would ask him how to make something look beautiful on the front end. From there, I started teaching myself coding languages like HTML, CSS, Python, Ruby on Rails, and more. I like to teach myself things. With software sales, you have to be willing to get things done, though you don’t have to teach yourself. What was the preHIRED application and interview process like? After applying on the preHIRED website and taking an assessment, I had an interview with a Growth Partner, Lael, who then spoke with Josh, the founder, and they agreed I could be invited into the program. They are very particular about who they accept, especially since they have a money-back guarantee – they want to make sure that everyone is successful, and that was very cool to me. They are really focused on making sure you’re going to be successful and get a job as soon as you can. What was the preHIRED curriculum and learning experience like? The online program is 40 hours long – a lot of people take about two to three weeks to finish (probably a bit longer if you have a job or kids), but I completed it in one week. There are videos and practicums, which can help you learn about platforms like LinkedIn and other specific sales tools. I loved technology so already having that background knowledge helped me significantly. The program is broken up into modules – I focused on one at a time, went through all the videos, and then completed a practicum to demonstrate what I learned. As an example, after the LinkedIn Module, I had to show that I knew how to use the platform with a photo, a headline, and a flushed out profile, and then the program staff could check it to confirm I actually did the module. The preHIRED staff check in with you every week to see how it’s going, where you’re at, and whether you’re submitting all the materials for the certification. They also have 1-on-1 mentoring where you can book video calls to practice the sales skills you’re learning and to prepare for interviews. We could also can contact preHIRED staff for assistance via email at any time, and they were very responsive. Because they teach you to use sales tools that notice how quickly someone opens your email, we can see how fast the support staff are opening our emails and responding. It’s pretty cool! What topics were covered in the PreHIRED modules? The cool thing about preHIRED is they use job hunting to teach you how to do the job of a Business Development Representative. So you’re doing the work of finding your job in the same way you’ll prospect for a new contract at your future software company. The curriculum focuses on three key categories for sales success: Tools, Skills, and Workflows.. The goal is to help you learn how to prospect, qualify, and connect with hiring managers or a VP of Sales, and how to build an impactful sales system so you’re not wasting your time writing emails over and over again. You learn how to have a meaningful conversation with someone you’ve never spoken with before – which is exactly what you have to do as a job applicant, and as a salesperson. Because I’m a tech guy, I loved learning and using all the tools. I’ve used CRMs (customer relationship management tools) before, but I used a different CRM at each company and only had basic training. preHIRED covered six categories of sales software I had no idea even existed outside of just CRMs: CRMs, lead generation, lead enrichment, sales automation, productivity tools, and even artificial intelligence. They also teach you soft sales skills like handling rejection. These are basic skills that can benefit anyone entering sales at any point of their life. Once you got through the learning material, how did the preHIRED team help you prepare for job interviews? The preHIRED team went over interview questions with me, and I was able to come back with additional questions and scenarios. They help you with interviewing in general as well as specific questions that software companies will ask. Companies can ask some really crazy questions to see who you are as a person and how you’ll interact with the team, so it was good to have that preparation ahead of time. Were you able to communicate with other preHIRED students during the program? It’s not exactly a classroom setting, but you’re aware of the other students who are currently doing it or have gone through the program because they have a Slack group where everyone can interact. Alums of the program are interacting with current students, and that’s actually how I got my current job as a Sales Development Representative at Outreach.io. That’s awesome! Tell us more about how you landed your job at Outreach? I read an interview on the Course Report blog with Philip Jansen, a Sales Development Representative at Outreach, and I reached out to him through LinkedIn to learn more. I also listened to a podcast interview with Outreach’s Sales Manager. At the end, the interviewer asked how someone could get in touch if they were interested in working for her – she invited listeners to go to her LinkedIn profile and call her cell phone directly. So I did! I had already applied to Outreach online and spoken with Philip, so using the preHIRED selling tools I had learned, I was able to have a very natural and friendly conversation with the Sales Manager. She loved the fact that I reached out directly and brought me straight to the final interview. Philip was able to advocate for me in the office and she was also familiar with Josh at preHIRED. She even asked me if there were other students she could hire! What does Outreach do and what’s your role at a Sales Development Representative? Outreach is a sales automation tool focused on helping sales teams sell more. They do this by helping sales members prioritize leads, stay informed on new events related to their leads, and stay on top of opportunities. It’s really exciting. As a Sales Development Representative, I do outbound sales through prospecting, and I try to set up meetings so we can do product demos. Outbound sales is where the marketing department uses email technologies to send me the names of people to cold call or email who may never have reached out to the company, but may be exploring the website or are interested in the product. “Prospecting” means that I am actively going out and talking to people who are interested in getting the product or service. Why did you decide not to go forward with being a software developer? What advice do you have for people thinking about making an intensive career change through a program like preHIRED? Just do it. I understand there are so many things, like family, that can hold you back, but I don’t think about that. I asked myself, “What can I do that’s going to help my family and put me in a financially stable position in 10 or 20 years when my kids are ready to go to college?” That’s why I did preHIRED. Sometimes, we think we can’t ask for help when we’re teaching ourselves something, but it’s ok to ask for help. Compared to before preHIRED, my base salary is much more and my on-target earnings are going to be much higher. I might have eventually figured things out on my own, but there was so much I didn’t understand. I learned much more quickly through a program with someone teaching me. It wasn’t easy at all and was definitely a challenge, but once you’re done and working, you’ll be much happier. Find out more and read preHIRED reviews on Course Report. Check out the preHIRED website. What led you to change careers and attend a Sales Bootcamp like preHIRED? I wanted to do better for my family and our future. I had been in ministry for several years and my income was strapped. I was a staff pastor at our local church and participated in missions work. So I did not generate a ton of income for my family at that time, even though we understood that was part of the sacrifice in the life of ministry. My wife and I loved working in the church, but when our son came along, things began to change. I switched jobs and worked at a real estate company. I had been involved in Nashville real estate for several years doing fix-and-flips, personal investments, and admin work, so it was an industry I knew very well; I could just show up and get to work. But, I was still not making enough to support my family. I drove for Uber and delivered for Uber Eats four or five nights a week just to make it. I considered doing real estate sales, but I had questions about how the real estate vertical could be impacted by new and emerging technologies like Zillow, Redfin, and OpenDoor. I didn’t have a lot of confidence about building a business in an industry that I believed was due for disruption. I started thinking, “What’s an industry that’s not going anywhere? What are we becoming more dependent on as a society?” – and the answer is the internet, software, and artificial intelligence! I started my research and pulled the trigger pretty quickly. A lot of people attend bootcamps to become a web developer – how did you know that you were suited for a software sales career? I did a lot of introspection, soul-searching, and personality tests to figure out my next steps. I started listening to some new voices via audiobooks and podcasts while I was delivering food. I’m a high communicator – I am the ‘I’ on the DISC profile which is well suited for people in sales. I also don’t type as fast as a developer should type, and I did not want to sit behind a computer coding all day. I was a communications major in college, I enjoy talking with people, I’m good at public speaking, and I’m confident talking on the phone – sales was a no-brainer for me. Did you research other bootcamps or college courses? Why did you choose preHIRED? I was researching online about software and software sales when a preHIRED advertisement about making six figures selling software appeared. I’ve taken different webinar classes in the past where you pay a few hundred bucks, and then you turn your knowledge into a stream of income. I know that those types of programs work for me as long as I follow what it tells me to follow – so I enrolled. I applied online and then had a phone interview. It was a 30-minute call and after they heard my story, the preHIRED team felt like I was a good candidate for the bootcamp. PreHIRED is online – did you work with other students during the course? There’s a launch date where students start at the same time on different courses, but when I took the course, there was no online interaction with other students. If I needed some help from Josh, the Founder and CEO, or other preHIRED staff, I had the opportunity to reach out via email or online chat. But I rarely sought help because the course material was pretty self explanatory. What was the sales learning experience like at preHIRED — tell me about the curriculum, a typical day and the teaching style? It’s a fully online course that you work through at your own pace, but I was putting in about 4 hours a day. It involves reading materials, watching videos, and completing assignments. There was no live teaching. The program includes detailed overviews of many of the major CRM software tools such as Salesforce and Hubspot, as well as exciting sales engagement platforms like Outreach. That’s where I was introduced to the potential at Outreach.io. I was working at the real estate office when I first enrolled in preHIRED, and a few days later, I decided to go all in, so I put in my 2-week notice and started implementing the course material full-time. I had completed it in about 3 weeks. Was the curriculum project-based? Did you do any real-world Sales projects? The main project, or goal, of the entire program, is to teach you how to initiate a sales cycle to land a job as an SDR. So preHIRED shows you how to position yourself as an attractive hire, they teach you the major tools that you’re going to be using, and then they focus most of the instruction on how to prospect and follow up with hiring managers. Then it’s up to the student put in the work and trust the process. How did the PreHIRED job guarantee work for you? When did you start looking for a job? preHIRED’s job guarantee is tied to your ability to find a job. The whole course is geared toward landing a job with a software company as a Sales Development Representative (SDR). 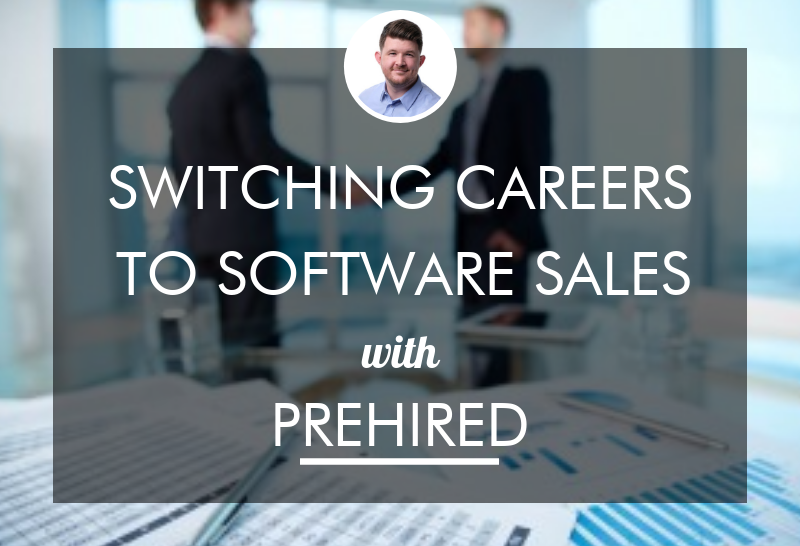 preHIRED teaches you how to use software to prospect into companies to land a job on a company’s sales team. Part of the final project requires you show the skills that you’ve been taught, by showing evidence of your research, interviews, and landing a job in sales – and that’s how you receive your certification. How did PreHIRED prepare you for that job hunt? preHIRED prepares you in advance. There’s a lot of content in the curriculum about what to expect in the interview, types of questions you’ll be asked, software languages, and terms you’ll need to know. I had never heard of 95% of the software being used in the course. Yet, when I started getting job interviews, preHIRED helped prepare me with the appropriate sales knowledge and lingo. I was fielding software sales interview requests during my last days of work in the real estate office. Fortunately, I was hired at Outreach about 10 days after my last day on the job. Tell us about your new sales job at Outreach! The program worked really well for me. Because I had quit my job in real estate, I was all in, and there was no plan B. I received 3 job offers, and they were all really great opportunities. Based on where the company is heading and their reputation, I held out for an offer from Outreach as a Sales Development Representative (SDR). In short, Outreach is a sales engagement platform that optimizes the reps’ sales process and allows them to power through outreach and follow-up activities at three times the speed. We put our clients’ sales processes into a structured series of touch points which takes care of their follow-up process. This ensures that every lead is thoroughly worked, never gets lost, and receives the 5 to 12 touches where 80% of sales happen. Marketing teams love this because we help bridge the gap between marketing and sales. We do all the administrative work for our clients’ teams within their CRM (Salesforce). This frees up their reps time, logs their activities automatically, and gives clients 100% accurate reporting. Sales teams love this because they no longer have to waste time logging data in the CRM. Finally, we open up the "Black Box" of sales and show clients in real time how each rep is performing, what activities they're doing, and what is and isn't working. This provides a solid foundation to accurately forecast results, improve outreach, and train clients’ teams. Management teams love this because they can get average reps and new hires performing like seasoned pros. Two weeks after getting the offer, I moved my family from Nashville to Tampa. The next week, I flew to Seattle for Outreach’s onboarding bootcamp and in my class, I was the first SDR to achieve a sales accepted lead, which is how we gauge our success as SDRs. In my first and second full months, I achieved 300% of my quota. I’m currently in my third month where I’m number two on a team of 11. I’m performing at the same level as very experienced Sales Development Representatives at Outreach. I’ve been very fortunate. How has the first few months been in the new world of software sales? How does Outreach ensure you’re ramping up and continuing to learn? I’ve been drinking from a firehose – there’s so much content, all the time. The company is at about 350 employees, but two years ago they were at 70 – it’s a rocket ship. Our onboarding process includes a buddy program, and there’s a specific step-by-step process and four-month ramp to follow. Your quota progressively increases during the four months, so my quota is not a full SDR quota. Although, I actually did hit a full quota last month. Next month, I’ll be a fully ramped-up SDR and expected to hit full quota. What’s been the biggest challenge or roadblock to switching to software sales? It’s completely different than anything that I’ve ever done in my entire life. Something Tony Robbins says has been super important for me – “success leaves clues.” Whenever you’re changing careers so drastically, realize that successful people were successful way before we came along. There are tons of successful SDRs, SDR managers, and account executives at Outreach, so if you literally follow what they tell you to do and trust the process, 99% of the time you are going to be successful. People try to reinvent the wheel too frequently. If you need to tweak the process down the road once you feel more comfortable, go for it. You can’t think you’re an expert in a completely new field. I adopted that concept very early on – humility goes a long way when changing careers. What advice do you have for people making a career change through a bootcamp? preHIRED is built for you to succeed. Bootcamps are built for career changers. If you’re curious, there are really strong online bootcamp courses to help you be successful. I’ve been successful with other webinar courses in the past, but this preHIRED course is definitely going to yield the most sustainable fruit in my life. And that’s the whole purpose – preHIRED helps you to be successful in a career change. Trust the process, even if it looks like it’s not working out, continue to trust the process. There’s a lot of faith and humility involved when switching careers. If you choose to enroll in a bootcamp – follow the instructions A to Z, and make it happen. Read more preHIRED reviews on Course Report. Check out the preHIRED website! Any other information you'd like to share with Andrew from preHIRED? By submitting, I acknowledge that my information will be shared with preHIRED. An email with these details has been sent to preHIRED. You've already applied to this scholarship with preHIRED.